The most common questions people have when starting to use their new washer dryer combo. If you cannot find your question here, please don’t hesitate to ask me through my contact form. My combo shakes and vibrates too much during the spin cycle. My clothes are still damp and not dry even after two hours of drying. Can I add liquid or powdered bleach? Can I Hook up My Washer Dryer Combo To the Water Heater Plumbing? How to Install a Washer Dryer Combo. Can I Clean My Combo with Vinegar or Baking Soda? How to Remove Grease, Grass, and Red Wine Stains. Is There a Performance Difference with Vented vs. Condenser Dryer vs. Washer Dryer Combo? What is the Smallest Washer Dryer Combo? What is the Most Energy Efficient Washer Dryer Combo? What Company Makes The Best Washer Dryer Combos? How to Wash And Dry Leaving Less Wrinkles? How to Convert My 220V Outlet to Support a 120V Combo? What does DOE or IEC stand for? Are Pinnacle combo RV appliances a good choice? Do these appliances come with wheels? How to clean the lint trap in LG units? How to open a locked machine by the security lock? Hooking up a washer/dryer combo up to a sink. Is the machine supposed to get extremely hot during the drying cycle? Midea MFL70 D1211S and EdgeStar CWD1510W error codes (PDF manual). Steam coming out of the vent at the top rear of the LG combo. How to clean under the agitator and remove any dirt around. New combo and a burnt rubber smell at the end of the dry cycle. Make sure that you have read the Installation Instructions in Manual properly and that you have removed all the shipping bolts and retainers that are there only for a safe transport. Mount your machine on a solid flat floor or some vibration isolation pads and thus reduce the vibration significantly. If you have the LG model WM3987HW, you can buy a pedestal with drawer designed for it. If it happens only on some loads, the problem is probably the type of load that makes it shake more than usually. If it’s this case you will have to use a lower spin speed to minimize this vibration. If your machine happens to have the SpinSense Feature, even better as you can simply activate it and it will do the job for you. Make sure that the machine has enough space around – at least one inch at the sides, and four inches at the back. Level the unit properly, however avoid using any objects like a piece of wood or cardboard. To make a proper leveling, start a spin cycle and make very slight adjustments to the feet as needed. You will notice that even a small turn can make a big difference and significantly reduce the vibration. Make sure you read the Manual properly to learn how to use your combo the right way (use the proper dry programs and features). It can take that long especially when you fill your drum to the fullest. Use smaller loads of your laundry – the smaller the load, the sooner and more effective will your clothes dry. After a few washes you will learn how much of and what combination of clothes will make the best result. The drying can take even less than 1 hour when you learn how to use it properly. Some people even take the advantage of the top of the machine. It gets pretty hot when doing its dry program, so after the wash you can simply take out half of your clothes and put them on the top. Then dry the clothes left inside for about one hour, then take them out and now you can put in the clothes from the top and dry them for 30 minutes or even less. This way you can use your machine as effectively as possible. When you get accustomed to your new appliance, everything will come to you automatically. If your clothes are still wet, use the dryer function for some extra time (every dryer has it’s own set of programs, so you’ll have to read the Manual). The LG models are especially good at this – you will need to use a timed cycle setting (which can be paused) and then you’ll be able to adjust the time and temperature of the dry cycle. Or, you can just set a dry only cycle as well. Just turn on your combo and press the dry button a couple of times to set the time. It is normal if you clothes feel slightly damp to the touch even though they are dry. This is entirely normal in the self-condensing drying process. All you have to do is just shake them out a little bit to allow any residual humidity to dissipate (it takes only a few seconds). Then you can fold or hang them as normally. Some combo models are better and some are worse at drying – just see my reviews and ratings on this website, which reflect this and many other areas. In an extreme case, especially if you see a lot of steam coming out of the drawer / tray, the problem could be that the the cold water solenoid valve had died (the top left hand of the machine with the 3 blue tabs, just right to the red square part in the picture on the comment above) which disables the water to flow into the condenser and then the steam doesn’t condense – you can tell this is the problem when intermittently you can hear a sudden “whoosh” for a second or two every few minutes of the valve opening up and water flowing out. You can also notice less water coming in and out of the machine. However, don’t worry, the solution is pretty simple – a new cold water solenoid valve for £25, two screws off, 3 pipes on and off and the problem should be solved. 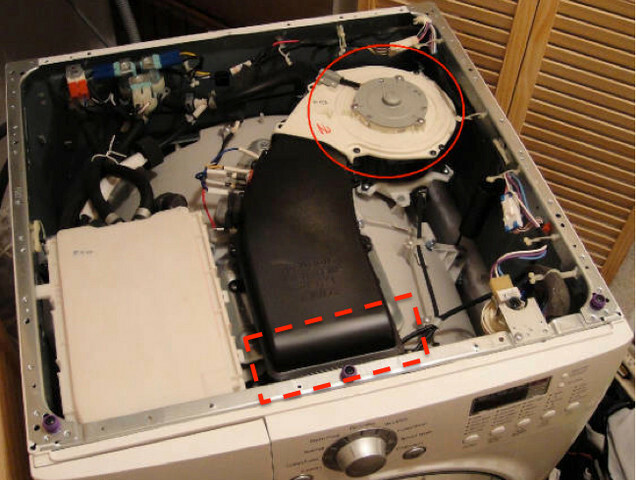 Some models may have more problems with this than others, but usually, reading the manual helps you maintain your washer dryer combo always clean and in a good condition. For example, the LG machines have a cover cap, which you open and wipe out the excess lint. You will have to pull out the hose –> unplug the drain plug (the water flows out) –> turn the pump filter to the left and remove anything that shouldn’t be there –> when you’re done, you’ll just turn the pump filter to the right and insert the drain plug to where it was. You should do this about every 2 weeks – this is directly related to the frequency of use. Some people just call the service to clean it two or three times a year. Especially in the smaller units the lint can collect inside int the internal plastic duct. In another case, especially if the drying has started to be less efficient, there can be some additional lint build up in the place where the air returns to the drum (highlighted in the red dashed area in the picture above). You can access it simply by unscrewing the black cover. You can also check the sensor just inside the air condenser assembly, and clean it with rubbing alcohol if dirty or accumulated with lint. 4. Can I Add Liquid or Powdered Bleach? You will have to read your manual at the appropriate section, but in most cases you can add them to the main wash compartment, however only with a detergent of the same type. Most washers also have a separate space for bleach and fabric softener, which automatically dispense at the right time. Always make sure that you use a quality and color safe bleach and fabric softener for a better dry and softer clothes. Don’t use a gel bleach. Use only a liquid one and maximally 1-2 tablespoons. The same applies for a fabric softener. 5. Can I Hook up My Washer Dryer Combo To the Water Heater Plumbing? 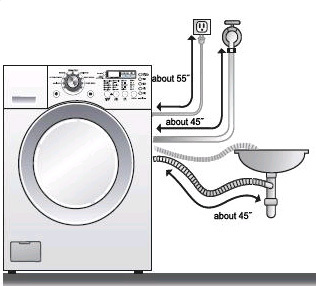 A lot of people planning to buy a washer dryer combo ask if it is possible to hook it up to a water heater plumbing. While this might vary from case to case, usually, if it fits your water heater closet, it should be OK. However, if your heater runs on gas, you will need to make sure that the combustion air has a good ventilation, which is usually outside air, the same applies to the exhaust fan. As far as the drain pipe, it can be inserted practically in any drain hole – either your bathroom or kitchen waste line (sink). 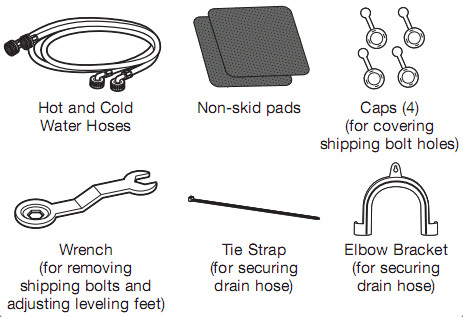 Usually, you will get these accessories included with your washer. Use the included wrench to remove the 4 shipping bolts. Then remove the retainers and press the hole caps into the shipping bolt holes. Try to get similar angles as on this picture. Drain hose in the hole of the floor drain system. 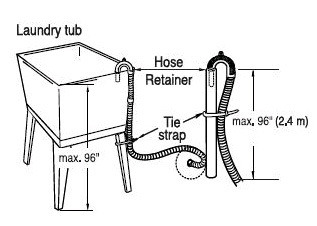 Keep in mind that the end of the drain hose shouldn’t be higher than 96″ (240 cm) above the bottom of the washer. Always make sure that you secure the drain hose properly to avoid flooding and damage on the floor. 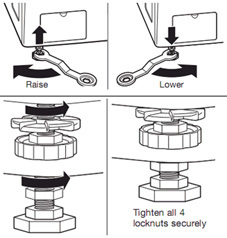 Level your combo from all sides and tighten all locknuts securely. This setup is not designed for RV’s (recreational vehicles). If you plan to go on a vacation, etc. , it is always better to turn off the faucet. This installation guide is just a general information, make sure you read the manual that comes with your machine! 7. Can I Clean My Combo with Vinegar or Baking Soda? You left your clothes in the drum for too long after the washer combo finished its work – usually more than 10 hours with the drum closed. Your combo and sink drains need some cleaning works, which usually happens when your machine is pretty old, wasn’t used for a longer time, is in a damp basement or the drain hose didn’t empty properly, which lead to spread of bacteria, microorganisms and mildew inside. If it’s the first situation, I can only advise you to really try to take out your clothes from the combo sooner, especially in case you didn’t use the dry function. The latter case does require a bit of more attention. It’s always a good idea to do a cleaning job at your combo once a year or so (more often if you have it in a damp basement), because it will nicely clean your drum and sink drainage hose from dirt, microorganisms, and mildew. The best of all – it’s really easy to do. All you have to do is run an empty load with a bit of baking soda and vinegar for about 5 minutes and then rinse. This technique is completely environment-safe and you can use it even with your dishwasher. The other thing you can try out with your washer dryer combo is to run an empty load with bleach. It doesn’t really matter which method you’ll use (you can try them both), this way you can kill and get rid of any bacteria and mildew. Your clothes and area around the combo will smell fresh again. We all know it. It is so hard to remove grease, grass or red wine stains that we are literally scared to find them on our clothes. But is there really no way that we could count on to effectively remove them? If you are interested in the answer you are on the best place. When cleaning similar stains, it is very important that you don’t put it in your regular wash load as it could definitely destroy your chances to remove them. Also, you don’t want to put that in your dryer before the stains are completely off. Use an automotive hand degreaser – the kind you use to clean up after working on your car. It is of gritty consistence and you can just rub it on the stain and throw in your regular wash. It works on all kinds of grease stains like from food, diesel fuel, lipstick, etc. Squirt some kind of a dish soap directly on the stains and let it sit on it for 30 minutes. Then you’ll just wash it in cold water with your laundry and that’s it. Your shirt or whatever clothing it was on should be stain free now. Put a baby powder (or a feminine powder) on your grease and oil stains and rub it with your fingers into the fabric. Leave it like this for a couple of hours and get back and shake it out outside really good and then wash it like normally. Pretreat the stains with a baking soda paste and then wash. You can also add a little bit of baking soda in the detergent area as well. Baking soda can be used with every wash – it’s said to increase the effectiveness of chlorine bleach – you can add 1 / 2 cup to your laundry, along with the usual amount of bleach. Sponge the stains with water and then rub in a little bit of alcohol diluted with water (1:3). Then just let it dry. Don’t use this method on silk or wool. Liquid detergent works also very well – sponge with put the detergent on the stain, rinse and let dry. If the two tips above didn’t help, soak the fabric with warm water and 1 table spoon of a stain-removing enzyme product for half an hour. Then you will need to rinse and launder in hot water with a bleach an appropriate bleach. In case you need to clean grass stains on dry-cleanable fabrics, the best you could do is to go to the dry cleaners and show them the affected areas. If you still decide that you want to clean it yourself, put some white vinegar with water on the stain and leave it there for a while (20 minutes should be enough). Then use a sponge with warm water to blot that. A paste of baking soda together with water and vinegar can also dot its job, just try it out. The good news is that in a lot of cases the cleanser for red wine stains is at hand. It’s the white wine. Pour a little bit over the stain, which will neutralize it. Then you can just throw the clothing to the combo. ATTENTION: Don’t use the dry function just yet. The problem is that unless the stain is completely removed, the dryer can bake it in there forever. The same applies on ironing – don’t do that unless you are sure it’s not there anymore. If the above doesn’t work you can always apply the most universal cleanser – vinegar. Sponge it on the stain and try to blot the red wine stain. Don’t worry about the smell, it will disappear after you wash it like regularly. Use mild liquid you use in dishwashers with hydrogen peroxide (1:2). Rub it in and do a normal wash – without dry function of course. Pour club soda on the stain and blot it with a sponge. Sprinkle baking soda or salt on the spot and blot with a sponge or a damp cloth. Whatever method you use, it is always very important to do it as soon as possible. Don’t forget that you can put the affected clothes through the dryer function or iron it, only after you are sure your cleaning was successful. 9. Is There a Performance Difference with Vented vs. Condenser Dryer vs. Washer Dryer Combo? You can find a lot of information on this topic on the internet and the opinions vary a lot. In the past people had better experiences and are accustomed to the vented dryers as the condenser dryers needed a little bit of time to evolve to the current position on the market. Nowadays we can say that it doesn’t matter if you have a vented or ventless solution the result is the same. Of course there are still differences in the quality of respective brands and models, but that’s another issue. If you buy a good washer dryer combo (they use the condensing method) you don’t have to worry about the quality of dry. Also a lot of people ask if there is any difference in performance between the ventless standalone dryer and the washer dryer combo. The fact is that they both use the same ventless method to dry and their quality depends on the particular model and brand. 10. What is the Smallest Washer Dryer Combo? There is not anything like an extra small washer dryer combo or so. All combos have a width around 24 inches. If you are looking for a small and quality one, I would suggest you to have a look at Fagor FAS-3612. With it’s dimensions of 23.23″ x 33.5″ x 21.65″ it is the smallest one I found so far. 11. What is the Most Energy Efficient Washer Dryer Combo? Lg washer dryer combos are considered to be the top ones in this industry. They use the latest technology to save water and energy. All manufacturers now try to make products friendly to our environment as well, which is very good and should be the top priority in my opinion. 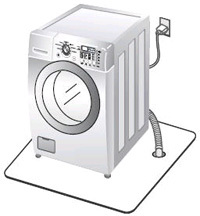 A full-sized ENERGY STAR qualified clothes washers uses 14 gallons of water per load, compared to the 27 gallons used by a standard machine. That’s 50 percent less water, per load. The best LG model seems to be the LG WM3455HW, which is also ranked #1 on my website as you can see in the right hand corner. 12. What Company Makes The Best Washer Dryer Combos? I have reviewed a lot of these machines and I came to a conclusion that the following are the top 5 companies on the market that really do a great job to make our washing and drying as fast and convenient as possible. 13. How to Wash And Dry Leaving Less Wrinkles? The combo machines are a great help and space saver in our houses and apartments, but cannot make miracles. The fact is that while you can wash your clothes with the drum filled to the maximum, it is pretty logical that the dry function won’t work the same way. Use just a half of the drum. Set the speed of the spin to around 700 rpm. Set a lower water temperature. This way you will get your clothes perfectly dry and wrinkle free, some say that it’s almost better than ironing! 14. How to Convert My 220V Outlet to Support a 120V Combo? If your washer dryer combo or other appliance requires a 120VAC, 60Hz grounded outlet you have to use exactly that. However, there are also devices that come with a voltage converter and can work with input voltages from like 100 to 250V or similar, such as computers, laptops, vacuum cleaners, etc. It is always written on the label you can find on the back of the device and adapter. Anyway, if your combo specifically requires a 120VAC, 60Hz and you have a dedicated 220 volt outlet, you will need a voltage converter or transformer. I could also tell you how to do change your 220V outlet to a 120V, but I would never try to do that as it is always dangerous if you don’t know what you do. The best advise I can give you is to call an electrician and explain the problem you have. However, there is a significant advantage of a 220V circuit and that is in the drying speed as it uses a higher heat than a dryer running on a 120V circuit. If you thought about a transformer, it is not a good idea because although you can step up the voltage to 220V, your 120V circuit will probably not have the necessary gauge to supply that current. You would need to change your 120V circuit to handle the doubled current. 15. What Kind of Detergent Should I Use? It is obviously always best to list the manual that came with your washer dryer combo and look in the appropriate section to find your answer. Unless your manual says differently, it is best to use only a low-sudsing HE (high efficiency) detergent (soap), such as ALL, Fresh Start, Purex, Bold, Solo, Tide HE, or Ecovantage. Otherwise, it could partially get stuck in your tray, etc. Both, powder or liquid consistences are good. The amount of only 1-2 tablespoons is highly enough. If you see soap bubbles during the wash cycle, that means you use a lot of detergent and you have to reduce it. As far as the bleach, make sure it is powder or liquid (not gel) and also color safe. If you use a fabric softener, only use a liquid one and dilute it with water in ratio of 50:50. Then put it only in the softener dispenser. Don’t use more than 1-2 tablespoons and try to use bio-friendly and those that appear light in color. They are better for your clothes, combo machine and the environment as well. Please note that it is not recommended to add bleach or additives directly into the drum. Always use the dispenser tray instead. 16. What does DOE or IEC stand for? They are both different standards of measurements. DOE stands for Department of Energy and IEC is for International Electrotechnical Commission. You can have two washers, one with the physical size of drum of 3.2 ct.ft and without the agitator inside and the other of 3.7 ct.ft. and with the agitator inside. So the usable space is the same (3.2 ct.ft.) and this is how DOE would rate them, however, the IEC would call the 3.7 ct.ft. with agitator a washer with capacity of 3.7 ct.ft. 17. Are Pinnacle combo RV appliances a good choice? Unfortunately, so far I was not able to find very positive reviews about by this brand. Actually, people advise against buying them for a bad quality and horrible support when it comes to repair and getting the parts. You might want to check out also this link: https://community.fmca.com/topic/3012-pinnacle-appliances-be-very-very-cautious/ for more information. 18. Do these appliances come with wheels? No, but if you need an additional portability you can add to the basket the Single Caster Wheels. Or in the case of LG you might be interested in the portability kit. 19. How to clean the lint trap in LG units? If you prefer detailed written instructions on how to open the unit, you will find them in the description part below the second video. Instructions for cleaning of other brands and models are pretty similar. If you simply run an empty sanitary cycle with detergent once a month, the machine will expel the trapped lint in the back of the unit and you’ll keep it clean. When you sanitary wash the unit, you’ll see the chucks of lint on the drain cover. The drain pump filter is located on the lower left-hand corner on the back of the unit. The directions are as followed:a. Open the drain pump filter access panel. b. Remove the plug from the drain hose, and allow the water to drain completely. c. Unclip the drain hose and pull it out. Place the end of the drain hose in a pan, bucket, or floor drain to catch water. d. Twist the pump filter counter-clockwise to remove. Remove any lint and foreign objects from the pump filter. 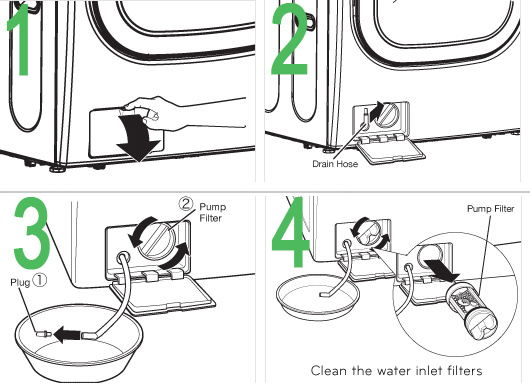 Reverse the above steps to reinstall the drain pump filter and drain hose. Be sure to close the cover panel when finished. Don’t forget to clean also the lint accumulated around the rubber on the opening of the machine, one swift wipe with a towel should be enough. 20. How to open a locked machine by the security lock? If you have a different brand of machine and the steps in the previous videos don’t help, I’d advise to call the company and have them tell you what to do if you are still in the warranty period. Don’t try to repair it yourself as you can lose the warranty. 21. Hooking up a washer/dryer combo up to a sink. If you find your machine leaking water from the front panel, door seals (gasket), etc. please have a look at this video to get an idea how to prevent leaking issues by a proper maintanance. Cold air drafts in your laundry room are often caused by stuck dryer vent flaps or faulty caulking. In addition, gaps caused by poor caulking jobs can allow insects and rodents to get into your home. To the problem first try to clean any lint buildups in the vent which might hold the vent flap open and let the cold air leak out. If that doesn’t help, the best thing is to buy a draft blocker, which can be easily installed on the vent. Watch the video below on how to do it. 25. Is the machine supposed to get extremely hot during the drying cycle? Is the side of the unit suppose to become extremely hot? 26. Midea MFL70 D1211S and EdgeStar CWD1510W error codes and door unlock problems (PDF manual). Start/Pause once and selecting the desired option. If interested, here is the complete owner’s manual for Edgestar/Midea combo. 1.) Error Codes: E3A, E10, E21, E30, E37, etc. 27. Steam coming out of the vent at the top rear of the LG combo. “I emailed LG service about this and although I was happy to see a prompt response, their recommendation was for an LG technician to check out the unit. Their indication is that the drying system is sealed and should emit no steam. I inspected the machine and found that there is a very simple check valve that connects the drum to outside air and is designed to allow air into the drum (to relieve vacuum so the door can be opened) but should seal when there is pressure in the drum (like during dry). 28. How to clean under the agitator and remove any dirt around. 29. New combo and a burnt rubber smell at the end of the dry cycle. After you purchase and start to use your new combo, it can happen, that you’ll feel a little hot plasticky smell at the end of the first drying cycles. In most cases it’s just a problem of new plastics and you can avoid it by setting the machine to the “Low Temperature” drying cycle. The drying will take a little bit more time though. To read a real user experience with this problem visit this forum discussion.